These bottles are very easy to re-create. Here's what you will need from the Eclectic Paperie Store. 5. Rub bottles with Inka Gold and embellish as desired. This is a super simple project and make beautiful decorations. Be sure to stop by the Eclectic Paperie Store for all your supplies and thanks for stopping by The EP blog today!! Eye candy and super easy! What lovely shades of pink on these festive bottles Debbie! So pretty with the blooms around the necks! 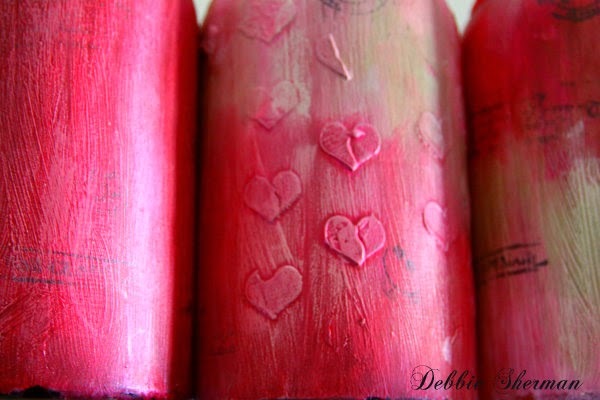 Debbie, FAB color on your Pretty bottles! They would look so GOOD in my pink craft room! LOL!